I must be one of maybe six people in this city hoping for more snow. A selfish sentiment, I know, as the logistics of dealing with upwards of 2 feet of the stuff is a huge physical and financial burden on both the city and residents. Let’s just say I am grateful my car is parked underground. Apartment dwellers like I have little to care about beyond remaining upright on slippery sidewalks and avoiding drowning risks at every slush-filled street corner. Getting around by car is unnecessary because the subway always runs, no matter the weather (at least in Manhattan anyway). Rather, the numerous snowstorms, seven so far, that coated the city have prompted me to hit the streets with camera and tripod like nothing else. More snow, please! Thursday’s early morning blizzard prompted me to check out a historic West Harlem (Manhattanville) church that had caught my eye not far from my office. It’s a picturesque place with a garden in front and an actual 1850s clapboard parish house next door. I had a very pleasant encounter with the rector and some of his staff and managed to shoot a few frames. Again, my luck, the lunchtime sun skittered behind the clouds minutes after I set up the camera. I look forward to returning when I have more time, preferably after another snowstorm. So we’re back to the viaduct one last time. I’d seen good images of the full length of this structure but I hoped I could capture something a little different. Morning sun coupled with HDR did the trick I think. I’m new to this technique and I’m sure the image could use additional some post-processing work but I’m pretty satisfied. If at a later date I can make the top side look as interesting as underneath, I’ll post photos of that, too. Friday began with some promise. It snowed all night and the storm was forecast to continue into the morning, another opportunity to do some urban in-the-snow work. No such luck, however. The snow stopped falling before I left for work. Still, not a complete washout since post-storm clouds can be good subjects. Alas, no luck again as I was rewarded with clear blue skies and no pre-workday inspiration. I remained optimistic. Thanks to the bright sunshine, lunchtime looked good. 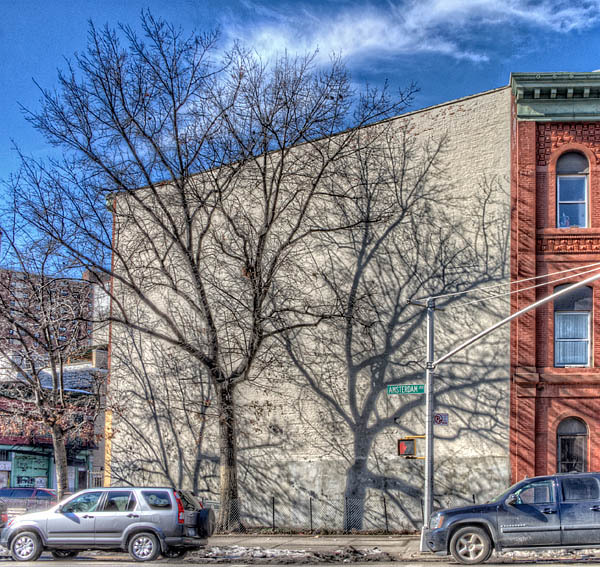 We’d had several days of overcast skies prior to Friday, I was looking forward to working on a couple of spots near Amsterdam Avenue that offer some interesting shadows to play with. Tripod in hand, off I went and within 5 minutes, clouds that had been non-existent that morning formed a pretty decent overcast and killed my shadows. So, no photo work that day but the venture wasn’t a total loss. I scouted a few angles, found contact information for tenants in a couple of very old buildings in the area and nearly froze my fingers off in the cold (I must find myself the right gloves/mittens for really cold weather!). Such a negative story but that’s the way things work sometimes. The forecast is looking good for the latter part of the week after the city endures its fifth winter storm. Fingers crossed! In the meantime, this image is from the last good snowstorm, aesthetically-speaking. 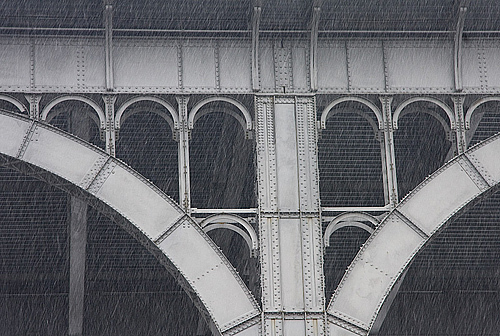 This is a detail of the Riverside Drive viaduct. 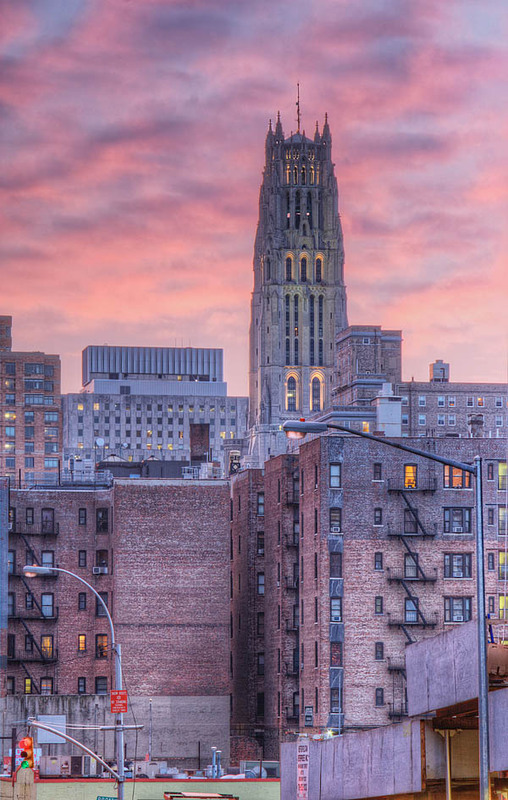 A product of the City Beautiful movement of the late 19th century, the whole thing was constructed in 1900 to join two sections of the Drive on either side of the valley situated between Morningside and Manhattan Heights. We’re familiar with the valley as Manhattanville. During the Revolutionary War, George Washington successfully protected this area, what he called Hollow Way, from the British in the Battle of Harlem Heights. But I digress. The attention to detail of this structure is wonderful, a mix of beauty and utility. A pleasure to photograph. When I started working in New York many years ago, it never crossed my mind that I’d end up in an office uptown in Harlem. Harlem was one of those parts of the city that existed as a no-man’s land in my mind; way uptown and scary. Having worked there now, in Manhattanville to be specific, for several years, I have learned that it is certainly gritty and while not necessarily dangerous, still a place to be respected. 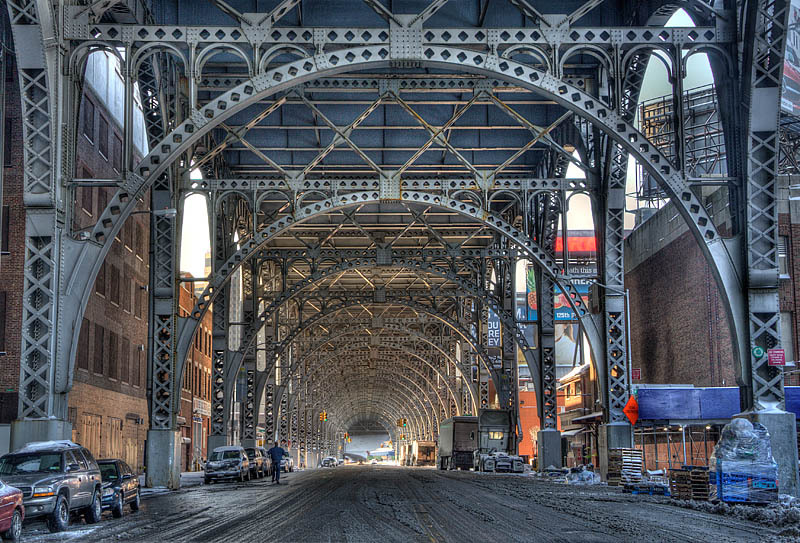 It is a neighborhood of former meatpacking facilities, auto body shops and old urban stable buildings. Yet, it is a very old area with its own history and beauty if one chooses to really look. 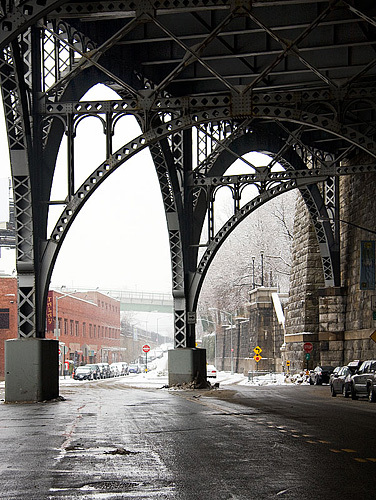 The first snowstorm of 2011 prompted me to set out under the Riverside Drive viaduct. I wondered how the snowfall might have transformed the area and I wasn’t disappointed. This was one of a number of images I took that day. I really like the juxtaposition of the patterns in the viaduct against the stone wall supporting the viaduct. The snow just adds another dimension to the whole thing.